SNAP!!! Geocaching: GCHR Annual Picnic THIS WEEK!!! which means a day full of geocaching fun!!! Here is just some of what you can expect!!! All day: Space Coast Geocaching Store for all your geocaching supplies! a container! Find it at the coordinates in the egg. 09:30 Geocaching 101 with Wheels. or anyone with questions about getting into geocaching. Bring your GPS to Norton, Virginia and join me!!! What: find out exactly what a WOODBOOGER is!!! 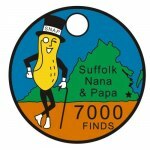 Labels: #geocaching, #gogeocaching, #SNAPgeocaching, Geocache, Geocaching blog, SNAP, SNAP!! !